On Tuesday August 16th, The Minister of Finance, The Honourable Mr. Christopher Sinckler presented to the House of Assembly, the Financial Statement and Budgetary Proposals for the year 2011. Relevant to the real estate industry, there was a proposal to modify the land tax value bands, which at first glance would mean lower taxes. It is important to note that these changes impact improved residential properties only (no changes to vacant land or commercial properties). This follows on the heels of the new land tax valuation notices issued two months ago when many property owners were faced with an increase in assessed values. The table below shows how the annual tax on your residence was previously calculated and compares it to the new structure. What do these changes REALLY mean for you the taxpayer? Let’s cast aside for a second the increases in some assessed values. The expansion of the value bands means that a higher percentage of your property value is calculated against a lower tax rate. Hence, where property values have remained unchanged, property owners should expect a reduction in their annual land tax expense under the newly proposed structure. 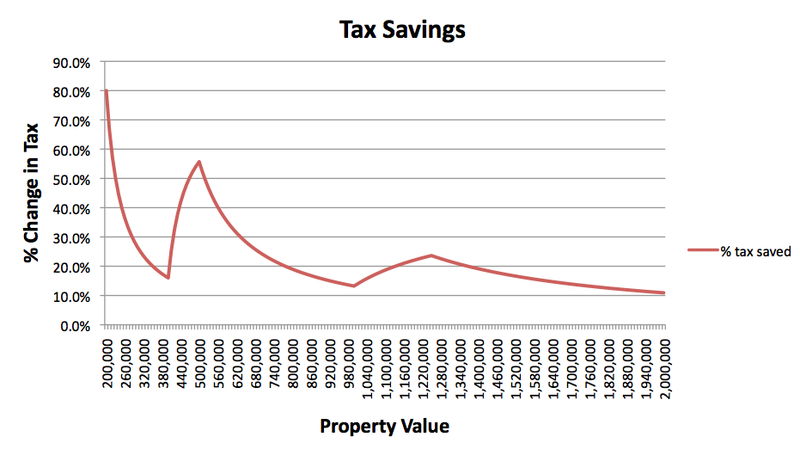 The graph below illustrates the percentage change in taxes for values ranging from $200,000 to $2,000,000. Properties in the value range of $400,000 to $500,000 will see a reduction of up to 50% in the tax payable. For properties in the $500,000 to $1,000,00 range, more modest reductions of 15% to 30% will be seen. Even properties at the $2,000,000 level will have relief of up to 10% of the tax payable. Those who will benefit most, on a percentage change basis, will be the owners of the lower valued properties and those properties, which will now fall into a lower value band as a result of the Government’s initiative. The latter can be identified by the spikes in the graph above. This works well to ease the burden of those who can least afford to pay. Beyond the upper band of $1,250,000, as your property value increases, percentage savings gradually fall leading up to the value where the maximum tax payable ($60,000) is reached. Beyond this there will be no savings. Hence, if your property value exceeds $8,750,000, you will pay the same tax as you did last year. The table below specifies how some taxes will change in monetary value. These pending tax reductions are welcomedbut we must consider that the new structure adds relief under the assumption that property values remain unchanged. However, in our June newsletter which we issued as a follow-up to the Land Tax re-valuation period, we indicated that based on the few notices we had seen up to that time, assessed values were trending upwards. This is in contrast to what we have experienced in the market over the past three years. If your assessed value has increased, savings maybe less easily recognised. Our analysis reveals that if your property value increased by 10%, the resultant savings will range from a zero percentage change in the tax to as much as 36% less than what was payable in the previous year with a few areas of minor increases (around 2%). If your assessed value moved by 20%, you will pay, on average, 15% more tax than what you paid last year. It is worthy to note that many of the new notices we saw had value increases in the region of 30%. At this level of revaluation, the average increase in tax is 36%. Tax changes are positively correlated to changes in property values but most sensitive when value increases result in a property being pushed into a higher band. This is because the excess value is calculated at a higher rate. As property values reach in excess of the upper band of $1,250,000, tax is less sensitive to changes in value as it is calculated at one rate only. It is safe to say that Government’s initiative, which is expected to ease the land tax expense is definitely favourable if your property value has increased by 10% or less. In excess of a 10% increase, the occurrences of tax savings are less frequent and gradually decline until there are no savings to be realised. This point is reached at about a 20% increase in value. With the lower limit of taxable value increased to $190,000 and the maximum tax payable remaining at $60,000, the majority of the tax changes falls on the middle-class. In conclusion these tax band changes taken on their own would have reduced the tax burden, however, they cannot be considered independently of the significant upward revaluations seen on some properties. While Barbadians have historically had land tax valuation assessments at levels below market value, that trend has changed. It is unfortunate that the Commissioner of Land Tax has chosen to revalue properties upwards within a market that has seen the first real reduction in market values in generations.